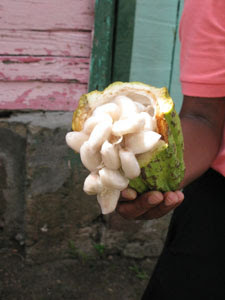 I took one of the raw cocoa beans from the shell in our guide’s hand and sucked it as she said children do, for the sweetness. But the large white bean was slimy and tasted nothing like the chocolate I knew. It was a long way from being ready for consumption—a process that involves drying, stomping, crushing, and drying again, eventually resulting in a chocolate powder or log that can be grated and used in recipes. We were touring Morne Cubaril Estate, the oldest plantation on the Caribbean island of St. Lucia, which still raises cocoa beans, coconuts, and sugar cane. 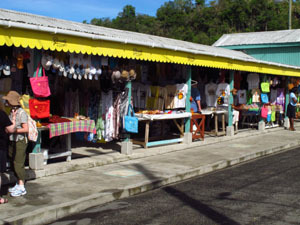 This was the noon stop on our all-day tour and the place we would be served a sumptuous Creole buffet lunch. But first we sampled fresh coconut meat and coconut candy and drank coconut water (sweet and thin). We sipped juice from sugar cane, squeezed out by a donkey working an old-fashioned sugar mill—all of which made us appreciate the pork and chicken meal even more. This was our first visit to St. Lucia, and we hoped to discover why it’s considered one of the most beautiful and romantic Caribbean Islands. So we booked an all-day shore excursion from the Emerald Princess cruise ship to get a good look at this lush volcanic island. From a steaming crater to golden sand and green rainforests, the views were stunning at all points. 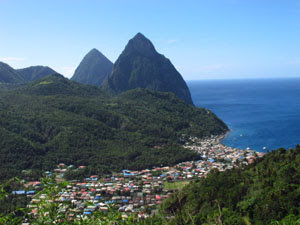 Some say Christopher Columbus discovered St. Lucia, but it hasn’t been proven. Regardless, it was fought over by the British and French--changing hands and rulers14 times before the island was ceded to Britain in 1814. But French influence remains strong—a broken French dialect is very prominent, and the staccato cadence is quite difficult to understand even though English is the official language. Our tour started in the capital city of Castries, the busiest and most efficient port in the Eastern Caribbean. From the north side of the island we traveled west, viewing abundant fields growing grapefruit, sour and sweet oranges, golden apples, limes, coconut, and bananas. 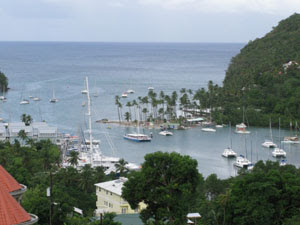 A high point overlooked Marigot Bay, a beautiful location featured in several movies. We passed Rosa Valley, the largest banana plantation on the island, and drove through six small fishing villages. 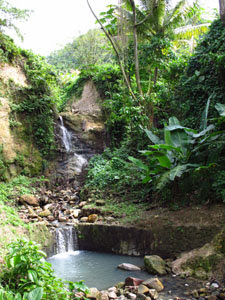 The first, Anse La Raye, has a large West Indian influence. While checking out the scenery, I ventured into the open air market and bought a set of lacquered bamboo baskets. Homes in Canaries, another fishing village, are colorfully painted red, yellow, blue, green, and pink—matching the bountiful blooms on the island. We passed damage on roads and bridges wrought by Hurricane Thomas in October 2010 as we headed east toward the rain forest, a tangled mass of thick green vegetation. Bougainvilla in pink, purple, and orange grew wild. Giant ferns up to 25 feet high hung over the road like umbrellas. Many hairpin curves, steep inclines and declines kept us swaying from side to side in the mini-bus as we motored toward the historic coastal town of Soufriere (Sou-fray). Suddenly, the dramatic Pitons or Twin Peaks, appeared to rise up from the water’s edge. 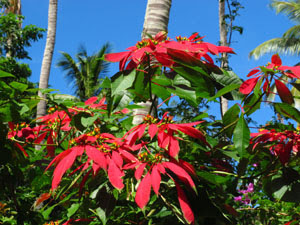 Although they aren’t the highest points on the island, they are the most photographed sight in the Caribbean. Three centuries ago the volcano imploded and left a caldera around the area. Three pools of simmering muddy water have been bubbling from the barren earth ever since, spewing clouds of steam 50 feet into the air. At the volcano's edge we walked down slippery steps for a better view of the waterfall's sparkling cascade and mineral pool. Public therapeutic bathing is allowed in the 80 degree water. A strong sulphur smell hangs in the air from gases being released. Back at Souffiere we boarded a catamaran for sailing to a beach. Swimming in pleasantly warm water and drinking multiple cups of rum punch convinced us that St. Lucia is truly an island paradise. GREAT ARTICLE! Next time you are on island, stop by and we'll buy you a drink....we love people who enjoy our island! Thanks! Where are you located?